Echinococcosis, commonly called as hydatid disease, is a parasitic infestation caused by the larva of the genus Echinococcus in human. Isolated occurrence of Echinococcosis without any evidence of visceral disease is very rare. A thorough search of the literature revealed only 11 cases of isolated cervical Echinococcosis. We report here a very rare case of isolated hydatid cyst in a 45-year-old female patient, who presented with swelling in right cervical region about 5 cm below the angle of mandible with no evidence of the disease elsewhere in the body. The case was diagnosed on fine needle aspiration cytology. The diagnosis was further supported by histopathology. We propose that the treating physician should also consider the differential diagnosis of Echinococcosis in the presence of an asymptomatic soft tissue mass, especially when the patient lives in an endemic area. A 45-year-old female presented with a right sided cervical swelling about 5 cm below the angle of mandible which had gradually increased in size over a period of 2 years. At the time of presentation, the swelling measured 4 cm × 5 cm [Figure 1]. The swelling was well defined, firm in consistency and was free from the skin as well as from underlying structures. It was non-tender without any sign of inflammation. She did not have any other complains. The ear, nose and throat clinical examination was essentially normal. The abdomen was soft and the chest was clear. Clinically, provisional diagnosis of tubercular lymphadenopathy, soft tissue tumors and lymphoma were considered. Peripheral blood smear examination was normal. Chest radiograph was normal. Fine needle aspiration cytology (FNAC) was advised by the clinician. FNAC of the swelling was performed under aseptic conditions using a 22-gauge needle. A volume of 4 mL of straw colored fluid with whitish fine particles was aspirated. The material was smeared on the slides. Cytocentrifuge preparations were also made. The slides were air-dried and fixed in methanol and stained with Geimsa stain. The microscopic examination revealed fair number of protoscolices and numerous detached hooklets, the laminated hyaline membrane of ectocyst and germinative layer. Protoscolices had rostellum with one or two rows of hooklets and suckers. The hooklets were refractile and had a claw like appearance with one pointed end and the other bifid end. The ectocyst was composed of loose connective tissue with numerous pyknotic nuclei. Calcific corpuscles were also present in scolices as well as in the germinative layer. These varied in size and were round to oval and stained bluish purple with Geimsa. The cytomorphology was consistent with hydatid cyst [Figure 2]. Thus, on FNAC primary diagnosis of hydatid cyst disease was made, a diagnosis, the probability of which was not considered earlier by the treating physician. The patient was again subjected to detailed examination. There was no past history of hydatid disease. Investigations to look out for any visceral evidence of hydatid disease were carried out. Ultrasound abdomen was essentially normal with no evidence of involvement of liver and any other viscera. Chest computed tomography (CT) was normal. CT scan of the cervical region was also done to know the exact site of the lesion. It revealed that the cyst was in the subcutaneous tissue of the neck. Thus, the diagnosis of subcutaneous cervical hydatid cyst was made. Surgical excision of the swelling was planned. The patient was put on high doses of albendazole (400 mg twice daily), 4 days prior to the surgery. Subsequently, the patient was operated upon and complete excision of the cyst was carried out. The cyst was subjected to histopathological examination. Gross examination of the biopsy showed a single grey white cystic mass measuring 4 cm × 4 cm × 2 cm. On cutting, the cyst was unilocular. 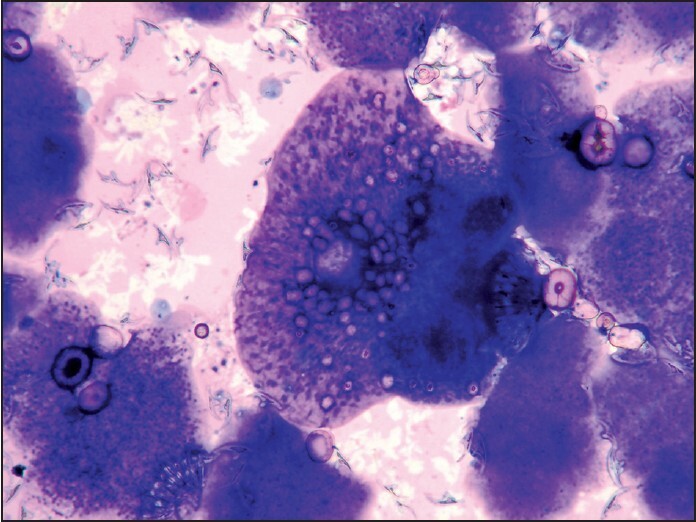 Microscopic examination showed acellular laminated ectocyst, germinal layer and scolex consistent with the cytological diagnosis of E. granulosus. Immediate post-operative period was uneventful. The patient was additionally given a high dose of albendazole (400 mg twice daily) for 4 weeks. At 1 year follow-up, there was no evidence of any recurrence and the patient was free from any visceral or soft tissue hydatisosis. Thomas, in year 1954, described the life cycle E. granulosus consisting of three developmental stages: (a) Adult worm in the definitive host, (b) eggs in the environment and (c) metacestodes in the intermediate host (humans). Human disease is acquired by ingestion of parasitic eggs (larval form) either directly from definitive hosts, such as dogs, foxes and intermediate hosts such as sheep and cattle, or indirectly by contaminated water or vegetables. In humans, the parasite eggs hatch in the small intestine, pass into the portal venous system or lymphatic system to reach the liver and lungs and form hydatid cyst. Moreover, they can cross the hepatic sinusoid or pulmonary capillary barrier, enters the systemic circulation and can affect all parts of the body. A review of medical literature revealed that the organs affected are liver (60-70%), lungs (15-25%), muscle (5%), bone (3%), kidney (2%), spleen (1%), brain (<1%), bile ducts, mesentry and heart. , Localization in soft tissues is extremely rare accounting for only 2.3% in the largest published series consisting of only 24 out of 1056 cases. Hydatid cyst of head and neck is rare even in the regions where the disease is endemic, but exact incidence is not known. , There are only a very few case reports of a primary hydatid cyst in the neck region. ,,,,,,,, In our case, the patient suffered from the isolated subcutaneous hydatid cyst of the upper cervical region with no involvement of any other regions. Ultrasonography, computed tomography and magnetic resonance imaging help in diagnosis and surgical planning of the disease. Hydatid disease can also be diagnosed by serology but all these techniques are not definitive. The gold standard for confirmatory diagnosis of hydatid disease is based on demonstration of the parasite either through FNAC or by biopsy. FNAC is a rapid and easy method to diagnose hydatid cyst. It is classically confirmed by direct demonstration of parasitic elements such as hooklets, scolices, scolices with rostellum and calcified corpuscles in the stained aspirated smear. , Identification of hooklets and laminated membranes by itself are presumptive finding in the cytodiagnosis of hydatid cyst. In our case, all these structures were present. This is evident that isolated occurrence of Echinococcosis without any evidence of visceral disease is very rare. However, the treating physician should also consider this diagnosis in the presence of an asymptomatic soft tissue mass, especially when the patient lives in an endemic area. 1. Arora V, Nijjar IS, Gill KS, Singh G. Primary hydatid cyst of muscle - A rare site. Indian J Radiol Imaging 2006;16:239-41. 2. Handa U, Bal A, Mohan H. Cytomorphology of hydatid cyst. Internet J Trop Med 2005;2:6. 3. Eckert J, Deplazes P. Biological, epidemiological, and clinical aspects of echinococcosis, a zoonosis of increasing concern. Clin Microbiol Rev 2004;17:107-35. 4. Garippa G. Updates on cystic echinococcosis (CE) in Italy. Parassitologia 2006;48:57-9. 5. Das S, Kalyani R, Kumar U, Kumar HM. A varied presentation of hydatid cyst: A report of four cases with review of literature. Indian J Pathol Microbiol 2007;50:550-2. 6. Iynen I, Sogut O, Guldur ME, Kose R, Kaya H, Bozkus F. Primary hydatid cyst: An unusual cause of a mass in the supraclavicular region of the neck. J Clin Med Res 2011;3:52-4. 7. Ahmad S, Jalil S, Saleem Y, Suleman BA, Chughtai N. Hydatid cysts at unusual sites: Reports of two cases in the neck and breast. J Pak Med Assoc 2010;60:232-4. 8. Muñoz Sánchez JA, Conthe Gutiérrez P, Arnalich Fernández F, Fernández A, García Seoane J, Ortiz Vázquez J, et al. The incidence of hydatidic disease in a general hospital. I. Epidemiological analysis of 1056 cases (author′s transl). Med Clin (Barc) 1982; 78:421-6. 9. Onerci M, Turan E, Ruacan S. Submandibular hydatid cyst. A case report. J Craniomaxillofac Surg 1991;19:359-61. 10. Eroðlu A, Atabekoðlu S, Kocaoðlu H. Primary hydatid cyst of the neck. Eur Arch Otorhinolaryngol 1999;256:202-4. 11. Kesici U, Kesici S, Türkmen ÜA, Ulusoy H, Duman A, Burakgazi G, et al. Primary cyst hydatid in the neck; report of one case. Turkiye Parazitol Derg 2011;35:217-9. 12. Hmidi M, Touiheme N, Rbai M, Messary A. Isolated hydatid cyst of the neck: An unusual site. Eur Ann Otorhinolaryngol Head Neck Dis 2012;129:108-10. 13. Chakrabarti I, Goswami BK. Primary hydatid cyst of the neck diagnosed by aspiration cytology. Trop Parasitol 2012;2:127-8. 14. Greenwood D, Slack RC, Peutherer JF. Medical Microbiology. 16 th ed., Churchill Livingstone: Edinburgh; 2007. p. 613.